Are you troubleshooting two-way radio problems? Having issues with your walkie-talkie, especially if you just recently bought it, is frustrating. However, the solution might be easier (and less expensive) than you think. It may have something to do with the way you’re using it. Before you call up the dealer to complain, here are some ideas as to what might be causing your radio to not be working properly. Are your accessories fully plugged in? Check that accessories such as an earpiece or shoulder microphone are fully plugged in to the radio. The jack should click twice when you plug it in. Always plug in the accessory when the radio is turned off. When you turn it on, the radio can then properly register the added accessory, so that it will work properly. Is the radio charged? Make sure your battery’s radio is always charged. If the signal seems to be fading, it may very well be the fading battery. It is helpful to have a spare battery on hand, just in case, so you can eliminate any down-time due to a dead battery. Depending on your radio brand and model, see our Motorola and Kenwood radio accessories for batteries and chargers. Rapid chargers are also available that will greatly cut down charging time. Have you programmed all the radios in your fleet? If you’ve bought multiple two-way radios, but only one is programmed, you will need to program the others with identical settings so that they can communicate with each other. If you think this is the case, call Tech Wholesale at 1-888-Walky-Talky for information about duplicating settings for your particular radio model. Is the antenna broken? If the radio sees a lot of hard use in the workplace, such as on a construction site, rough handling of the radio may cause an antenna, especially if it’s a long whip antenna, to break. If this has happened, the radio might not be able to receive the signal. Antennas are typically inexpensive to replace. Do you need a repeater? If you are trying to use your radio over a larger area than it was designed for, you might need to use a two-way radio repeater. This device takes the audio signal from a radio and amplifies the power to a higher wattage and at a higher physical level, sending the signal back out on a different frequency. This greatly expands the range of those radios. For a very large distance, you may require multiple repeaters to cover the entire range. Tech Wholesale is your best source for two-way radio expertise and the lowest prices on radios and radio accessories. 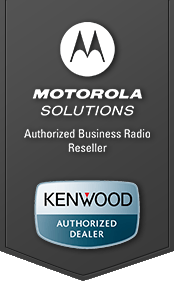 As a Motorola Authorized Dealer and Kenwood Authorized Dealer, we have not only the best products but the greatest expertise with these radios. If you still can’t figure out what’s wrong with your radio, give us a call and we’ll help you get to the bottom of it!